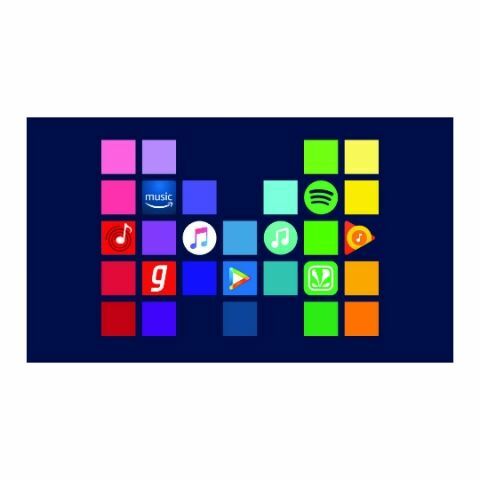 We have compared the services offered by various music streaming apps like Apple Music, Hungama Music, Saavn, Gaana, Google Play Music, Amazon Prime Music, Wynk, Jio Music and Spotify. Pitting them against each other, we find out which service has most to offer and who comes out on top. regarding which one to choose. On one hand, you had homegrown services like Gaana, Saavn and Hungama that have gained a formidable following, whereas on the other hand you have international behemoths like Google Play Music, Apple Music and the new entrant, Amazon Music. There’s a third hand in play here as well - telecom operator backed platforms such as Jio Music and Wynk Music. All of them have their own payment models and perks, with each trying to garner the attention of the musically inclined in its own way. We decided to pit them against each other and find out who comes out on top. This is how it turned out. Almost all the major music streaming services available in India have premium subscriptions at Rs 99/month, except for Amazon Music, which is tied to an Amazon Prime subscription, as well as Apple Music, that goes for a high Rs 120 for an individual membership. Wynk has a complicated price tiering depending on OS. If you are an Android user, the subscription costs the usual Rs 99/month. iOS users have to shell out Rs 120 per month, but iOS users with an Airtel SIM get a discounted rate of Rs 60/month. The little to no difference here makes any comparison depend on all the add-ons you get with the subscription. When it comes to the library itself, Apple Music, Google Play Music and Amazon Prime Music rule the roost at more than 40 million tracks. Gaana, Saavn and Spotify following up at 30. Hungama Music, along with the carrier-backed Jio Music and Wynk Music lag behind here with 10 million or less tracks on their platforms. While most Indian platforms get rid of ads for premium users, Amazon Music doesn’t come with ads. Instead, the entire platform is locked behind the premium Prime membership. This is similar to what Apple Music does with only Beats Radio being available for free. Google Play Music, on the other hand, offers free stations, where you cannot choose which tracks are to be played or skip more than 10 times per hour. The paid subscription on the same unlocks the entire library for streaming and offline playback. You can even buy individual tracks for offline playback and streaming if so desired. Indian platforms including Gaana, Saavn, Hungama offer their entire catalogue for free with ads, a la Spotify, along with multi-device playback up to 5 devices while limiting certain features such as HD streaming and downloads. The HD is not worth it if you don’t have the right audio equipment to tell the difference. Wynk offers discount pricing for Airtel users, whereas Jio Music is entirely unavailable to non-Jio users. Spotify is the most expensive at $9.99, but the features and the recommendation engine on the platform make it worth it, and even though it is not officially available in India, people have found ways to make it work here. Most of these platforms offer free trials for you to use and judge them first hand. Starting from Spotify’s short 7-day trial, Play Music and Gaana are limited to 14 days, and Amazon Music, with the Prime trial, goes up to 30 days along with Hungama Music. Apple Music takes this one with a three month trial period. So, if you just want to play music for free, Gaana, Saavn and Spotify are obvious choices. For specific tracks at high quality, you’ll have to shell some cash, regardless of the platform. Music streaming services allow you to play music at different bitrates. Essentially, lower the bitrate, lower the audio quality whereas higher bitrate gives you higher audio quality. Services don’t explicitly specify the audio streaming bitrate inside the app. Instead, they are simplified to display them as low, medium and high quality. The bitrate also determines how much data is going to be used. Low space in your local storage can be a problem since apps cache the songs temporarily while streaming. This enables you to play the song again without fetching data all over again. When the app is closed those songs are removed from the cache. Play Music caches these songs permanently. They are as good as downloaded songs. The lowest quality is usually used to save data. The bitrate ranges from 16 kbps to 96 kbps in the minimum offerings while it extends up to 320 kbps on the highest tier. These are compressed and lossy audio files. There are other services such as Tidal, Deezer, etc., that offer uncompressed and lossless audio up to bitrates of 1,411 kbps. Spotify is reportedly testing a lossless audio mode as well. These services aren’t available in India. So, you are left with a maximum of either 128 or 160 kbps in the free version. It’s also important to note that not everyone will be able to differentiate between the top tiers. However, you will notice the stark difference between the highest and lowest tier. The quality audibly distorts as you go down the tiers. Switching between the streaming quality matters if you have limited data plans. In the higher tier of audio quality, you will lose a lot of data comparatively. Some apps do consist of an automatic mode to switch to the best quality based on the available bandwidth. If you’re dealing with unlimited data then you don’t need to worry. Music streaming services are protective about their bitrates. Either they don’t mention it easily or it’s difficult to find. From among the ones we know, Gaana offers the lowest bitrate starting from 16 kbps. It will definitely save a lot of data but the songs will noticeably sound poor. Standard quality is mostly around 64 kbps or 96 kbps. This is usually the default bitrate. If you have sharp hearing abilities, you will be able to distinguish between the two bitrates. However, as it goes higher than 128 or 160 kbps, it becomes difficult to tell them apart. The highest bitrate offered for free out of the known ones is 160 kbps. Anything higher than that falls under the paid model. For a premium service, you are given 256-320 kbps. The only services that were explicitly stated their bitrate among those compared were Gaana, Saavn, Wynk, Jio Music and Spotify. There was a time when it made sense to pick the streaming service depending on the kind of music you listen to, and the big draws were the exclusives. Streaming services are moving away from exclusives because the content is not original, and at the same time it is considered an unhealthy practice for the industry. However, the sheer size of the library is important here, as well as the composition of that library. Apart from the library sizes, each streaming service has a plethora of stations and curated playlists. Apple is well ahead of everyone else with a vast library of 45 million songs. That lead compared to the closest competitors, Google Play Music or Amazon Prime (at 40 million tracks) is more than the total library sizes of some of the streaming services on the list, such as Wynk or Hungama. While Apple has a massive library, for users in India, the actual tracks available may not be the ones available even on Wynk with a much smaller library. The personal recommendations are updated on a daily basis. Apple has on offer some bizarre exclusives, including footage from concerts, documentaries about artists, and TV shows. Curiously enough, the actual audio shows, known as podcasts, have their own separate app. The focus is on the individual user, as the first set of playlists that Apple shows in the app are not pre-populated. Instead, they are there to give you a headstart into creating your own playlists. The playlist section does offer a wide variety of curated playlists, with some innovative and interesting selections such as “It’s Lit!”, “Relationship Goals” or “ ‘90s Electronic Workout”. The content is peppered with some Indian tracks, albums and playlist, but you will find plenty of western content which pushes music that few local users would want to listen to (Barney Essentials or Classic Children’s Songs). All the features are stripped down to their essentials. There is only one radio station, and the other curated selections are in the form of playlists. In all, the biggest plus for Apple is simply is large music library. Wynk arranges the content according to the languages selected. The problem is the first language in the list is prioritised for the content. Marathi and Hindi are above English on this list, and the experience of using the app changes if you choose to use English only. However, it is not what you would expect as some sections, including Wynk Top 100 show playlists with Hindi tracks anyway. You will definitely find something that you like in the Top Playlists section. The names of the playlists accurately describe the content. The content is regularly updated with the latest releases, so expect to see new stuff all the time. 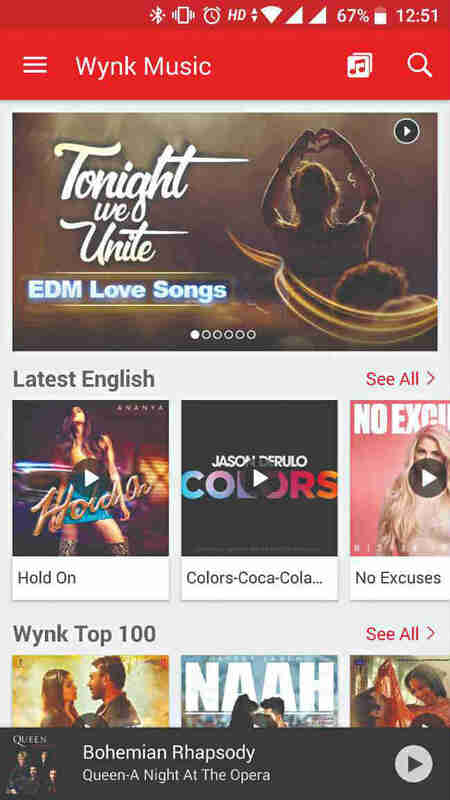 Gaana’s entire UI is oriented towards local content, which is a good thing. The “collections” have simple, easy to understand titles such as “rock”, “pop”, “melody”, “kids” and “Hindi”. As a long-term player in the streaming services industry, Gaana offers original content, and heavily depends on curation as well. There are Editor’s Picks, Curated Playlists, and even exclusive tracks known as “Gaana Originals”. From playlists about your favourite movie stars to the “wedding” station under the discover mode, Gaana totally understands the needs, requirements and listening habits of Indian listeners. Scroll right to the bottom and you will find a surprisingly good collection of Indie, Hip Hop and EDM tracks as well. While the names of the playlists and radio stations are a little staid, they are crystal clear in their content for all users. Gaana has a surprisingly large library, and you are likely to very rarely come across a song not available on Gaana. Hungama has a busy interface, stuffed with the latest trending songs, artists in the news, or songs relating to any holiday around the corner. One of the plus points in favour of Hungama is that it clearly separates playlists from radio stations. Additionally, the number of songs in a playlist is clearly indicated, allowing you to choose a playlist according to the time available. The variety of the radio stations is not great, and some of the names are vague and do not clearly indicate the content on offer (Artist Aloud). The interface does not make it clear which bits make the songs play instantly, and which ones throw up a playlist. A dedicated tab lets you watch videos, or video playlists. While having all the essentials of a music streaming service, Hungama does not really offer anything that makes it stand out. Saavn is a mature music streaming service, with a focus on offering regional language and local content. If you are not fussy about on-demand tracks or ads, a lot of the massive library is available for free. The problem with Saavn is the discovery. Radio stations for moods, activities, musicians and actors are shown in single panels, which are categorised by language. The languages available for stations are Hindi, English, Tamil, Telugu, Kannada, Punjabi and Marathi, which is fewer than the languages offered by other streaming services. Of these, only English, Hindi and Kannada offer radio stations for a variety of moods and services. The lack of radio stations does not really matter, as you can simply look up a song that you like, and start a radio station related to that particular song. The playlists section is considerably more expansive, where fourteen Indic languages are available, apart from English. There are some unexpected tie-ups in here, we spotted colour coded holi playlists by OnePlus. There are weekly playlists for Editor’s picks and new music. More than the radio stations, you are likely to find lists of songs for a particular mood or occasion in the playlists section. 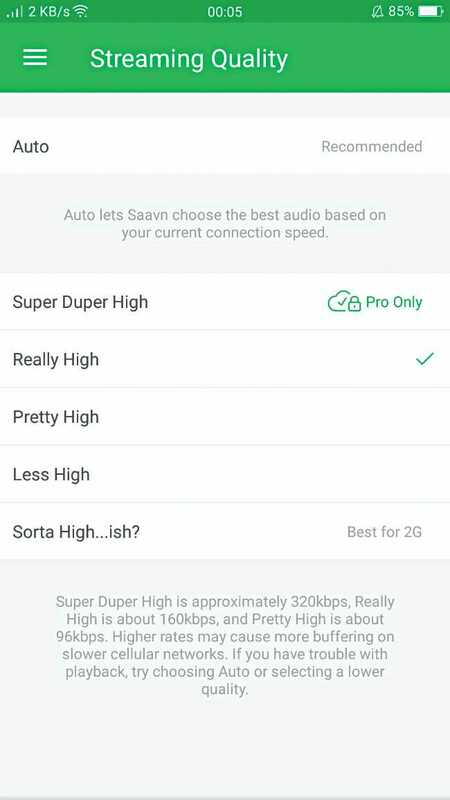 Saavn also offers some exclusive content, including shows and podcasts but that is in the paid tier. These shows are really something new that Saavn is trying, with all kinds of content normally not associated with music streaming services, including drama and sports. At over 30 million tracks, Saavn offers what looks like the most comprehensive collection of Indian music among all the streaming services. The albums it has put up online goes all the way back to a 1934 release of Amrit Manthan. Although there are stations and playlists, these seem like an extra, as the focus is entirely on the on-demand streaming service. With such a large library of Indic language songs, a problem and constant irritation is figuring out what spelling to us for a particular track. For example “nanne munne bacche” does not turn up any results, but “nanhe munne bachche” does. “O palanhare”shows up an album of devotional songs, the track in Lagaan is called “O Paalanhaare”. When in doubt, it is better to search for the album or movie directly or google the correct spelling. Google Play music has a trump card up its sleeve. That is because it is a music streaming service as well as a locker. You can upload your own songs to the service, and then stream it from anywhere, say another device. You are allowed to upload up to 50,000 tracks, and Google actually plays back the exact tracks that you uploaded. The service does not replace your tracks with tracks from its library. The stations feel well-curated and they work really well. It’s as if the service is like a friend with a good ear for music. The playlists tend to have good songs that have flown under the radar, as against popular and well-known tracks. The clean and simple UI makes it easy to find and get what you want. For example, stations are listed by language, category and “mood and activity”. Once you choose say “waking up”, you can pick between devotional, instrumental or regional language movies. There are also dance tracks listed here, so Google caters to all kinds of “waking up” needs. Listening to a song or a station adds it to your library, so you can listen to it again, and scroll through them just as you would with a personal collection. Surprisingly for an international streaming service, the content is as regional as it can be. In fact, there is more focus on local content. One of the biggest problems with JioMusic is how clumsy the interface is. You cannot even pause a song while searching for a new song, as the keyboard is overlaid on top of the playback controls. 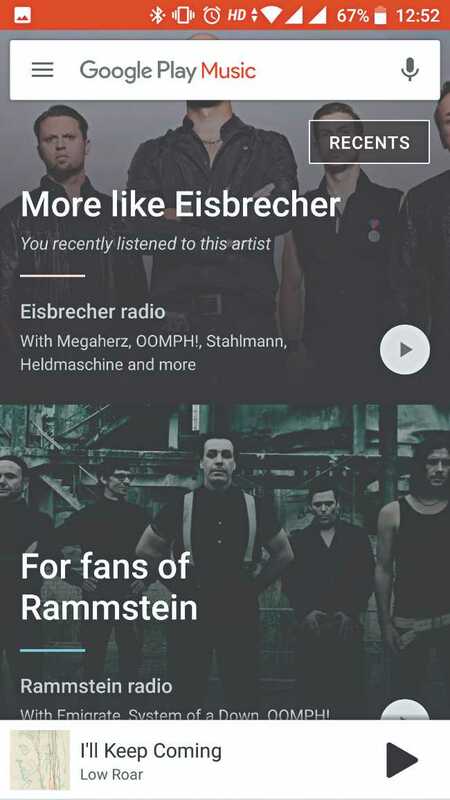 If there is a compilation album, the artist tag shows all the artists in the album for every track, so you have to use another app to even identify a song and the artist. There are no pure pop or rock playlists, these are bundled into stuff like Christmas pop songs and rock love songs. First song on the first playlist you get after searching for “Rock” is Chura Liya Hai Tumne. The good thing is that playlists are easy to identify as the number of tracks is listed. There is a wide variety available. In fact, we found some songs in the app that we could not find any trace of elsewhere on the internet. In any case, the collection seems to be expansive. There is even a dedicated section to K-Pop. While it is great to find the tracks that you like and listen to, the radio stations and playlists seem like they have been made 20 years ago, or earlier. Streaming services have numerous additional features that allow us users to explore the full potential of a music-listening experience. Starting off with something especially crucial to India, offline playback is found in almost all of the services mentioned so far. And almost all of them provide it exclusively to their paying customers. While Google Play Music lets non-subscribers buy individual tracks for download and offline consumption, anything beyond that track is still at Google’s shuffled mercy. Most of the music services offer multi-device support in some way or the other. If you are looking at just the ability to sign in on multiple devices, then after Spotify’s unlimited devices, Google Play Music comes in a close second at 10 devices (out of which 5 can be smartphones). While Gaana and Saavn are limited to 5 devices, Amazon Prime Music is also on par with Google at 10. But when it comes to simultaneous playback, the story changes. All 5 devices on Gaana and Saavn can stream their own music at the same time, whereas Apple Music and Spotify support 6 and 4 devices playing at the same time respectively under their family plan. Both Google Play Music and Amazon Prime Music officially support only one device per membership streaming music at the same time, much like Spotify’s standard plan. The only difference here is, Amazon Music lets you complete the current song you’re listening to before prompting you to switch playback to other device or continue just on the current one. It needs to be known that signing into Amazon Music on any smartphone transfers the authorisation of that device to that particular account for the app. So, to use any other account on that device after that within the next 180 days, you’ll have to contact Amazon customer care. The social listening aspect is also common to both providers and is almost exactly the same apart from, of course, Spotify’s add-ons like collaborative playlists. Spotify goes above and beyond this by providing features like private sessions (which is like an incognito mode but for your music streaming), artist profiles, in-app lyrics and more. Amazon Music’s USP in this area is the availability of Alexa on the app. In the Alexa section, you can talk to Amazon’s voice assistant in natural language, as long as you keep your queries music related. Interestingly, Gaana also offers a Gaana Assistant, which is similar but rudimentary compared to Alexa and can only directly search for terms you speak to it. For instance, when asked to play “something from the fifties”, both Alexa and Google managed to return relevant playlists from the decades, but Gaana Assistant somehow managed to play “Something’s Wrong” from “Fats in the Fifties” on one occasion and a 90s mixtape on another. And out of all of these, only Google Assistant, enabled on the phone, responds without explicit activation using a button. When it came to offering the best overall package, Gaana emerges as the winner, followed closely by Saavn. Both of these Indian platforms offer a good mix of free content and paid features, with Gaana beating Saavn by a small margin due to certain additional features and comparatively better scores in our performance tests. As of writing this comparison, news has come in that Jio Music is merging with Saavn, which comes as no surprise since the former scored the last position in our tests due to its limited offerings and carrier restrictions. While Google Play Music and Amazon Prime Music are big names in the music platform industry, their lack of ingenuity in features offered, coupled with sub-par support as compared to Indian platforms for regional music works against them. There you have it, Gaana is our winner!